Old Testament - Today we read Isaiah chapter 55, which is one of my favorite chapters in the Bible! I went to a wedding several years ago in Napa, California and God led me to a church in that town on a Sunday morning where the pastor preached an incredible sermon from Isaiah 55. It is a beautiful chapter for all of us who are Thirsty. Let us drink deeply of God’s Word today! Verse 1 tells us - "Is anyone thirsty? Come and drink--even if you have no money!" Are you drinking freely of the Bible this year? Even if you have no money, do you believe that God is inviting you to drink deeply of his True and Holy Water, His Word? Are you thirsty? Verse 6 is fantastic... Will you seek? Will you call? How do these above verses resonate with you, based on our One Year Bible readings? Particularly verse 11 above – is God’s Word accomplishing something in you this year through reading the Bible each day? 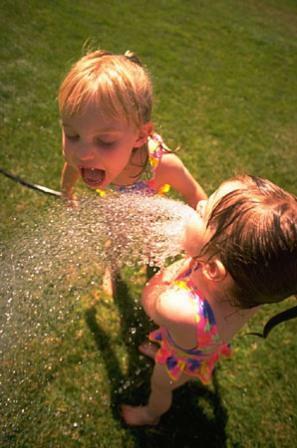 Is the Bible “watering” you? Are you Thirsty? 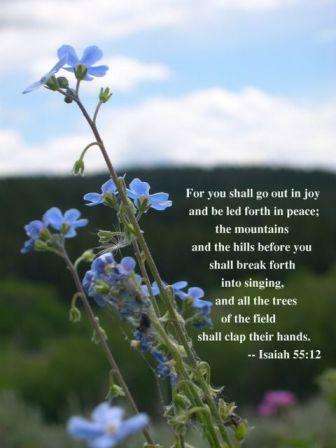 Do you feel that you are going out in joy and being led forth in peace? Have the mountains and hills burst into song before you? Are the trees of the field clapping their hands in your life today? Bible.org's commentary on today's readings in Isaiah chapter 55 titled "God's Exhortation to Receive His Grace" is at this link. New Testament - We wrap up Paul's letter to the church in Ephesus today! His letter to the church in Philippi begins tomorrow! Ephesians chapter 6 verse 7 stood out to me today - "Work with enthusiasm, as though you were working for the Lord rather than for people." I realize the context of this verse is that Paul was writing it to slaves. However, I think this verse works very well today for any of us that work a full time job. I'm sure you've probably seen movies or TV shows that make fun of working and basically encourage folks to work as little as possible when they are on the job. I think this is a horrible idea! I had a friend tell me once that if you are acting like a slacker at one job - perhaps a job you really don't like and are trying to get out of - you'll end up acting like a slacker at your next job, even if your next job is your dream job. You'll goof up that dream job because it will be hard to break habit the habit of being a slacker... So - I think each of us would do well to take to heart Paul's words here in verse 7. Are you working at your job with enthusiasm? Are you working each and every day as though you are working for the Lord? As such, are you not "stealing time" from your employer by surfing the net, socializing excessively, doing errands, arriving late, and this list could go on... If Jesus was your boss, would you act the same way at work that you do now? Well, is Jesus perhaps really your "boss" even if he isn't the one signing your pay checks per se...? Bible.org's commentary on today's readings in Ephesians titled "Spiritual Warfare" is at this link. Worship God: My comments in the Proverbs section above today reminded me of the great Aaron Shust song called "Give Me Words to Speak." His song includes this lyric: "Calloused and bruised. Dazed and confused. My Spirit is left wanting something more. Than my selfish hopes. And my selfish dreams. I’m lying with my face down to the floor. I’m crying out for more!" Awesome song! Here's a live version with Aaron on the keys! Has God ever given you words to speak? Click here and speak to God! Prayer Point: Pray that you are thirsty for the Lord. Pray that you come to Lord daily with your thirst. Pray that you receive freely Living Water from Jesus on a daily basis and forevermore. Within theses chapters, God gives us a picture of His prosperity and not man’s. In chapter 54 we here God tell the “barren” woman to sing because she has more children/descendants then those who have children by natural birth. In chapter 56 we are told the eunuchs who are without natural descendents will have a memorial and a name far greater then those who have many sons and daughters. The Gentiles, a people not promised the blessings that come through the Mosaic Covenant, will be blessed. All of this “Reversal of Fortune” is all conditional, all based on committing oneself to the Lord and serving Him (56:6). If those who are oppressed and persecuted because of their righteousness will be lifted up, then those who have lifted themselves up by way of their sin and stepped on the backs of others by way of abusive leadership, will find themselves abased or cast down. We also learn in this text that what God has to offer cannot be bought with money. What we need to quench our thirst cannot be found in any fast running stream of water, or any refrigerated case in a store it can only be found in God. "Hey, all who are thirsty come to the water! You who have no money, come! Buy and eat! Come! Buy wine and milk without money and without cost! Why pay money for something that will not nourish you? Why spend your hard-earned money on something that will not satisfy? Listen carefully to me and eat what is nourishing! Enjoy fine food! Pay attention and come to me! Listen, so you can live! Then I will make an unconditional covenantal promise to you, just like the reliable covenantal promises I made to David. When we “purchase” what God has to offer then the promises He offers to us are certain and assured and never conditional. 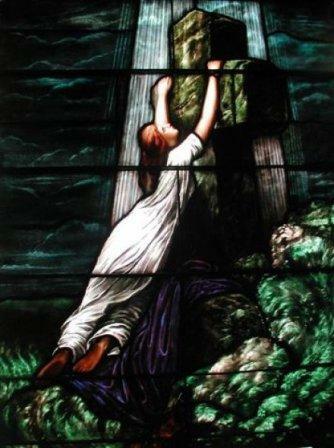 The way of the cross was through submission, Christ submitted Himself to the will of His Father, God. He accepted the shame of the cross to pay the cost of my sin, your sin and the sin of those yet unborn. Here Paul lays down that idea and principal of submission. Minor children are to submit themselves to the godly authority of their parents. “Slaves” (employees) are to submit to the authority of there managers/bosses/employers and those who are the “masters” are to submit to the authority of Christ in order to deal with their workers in a godly righteous manner. Then everyone must submit to God in order to take up the “armor” of God so that in the day of adversity, in the day of evil (that day when evil shows up) we all will be able to Stand. For those of us who have read through the Bible early enough to have read 1 and 2nd Samuel and 1 Chronicles, we remember that David was always being perused by enemies who shouldn’t have been his enemy: King Saul, his son, Absalom, his General and cousin, Joab, and the list goes on. Instead of taking his own vengeance, it seems that David prayed his feelings and thoughts back to God and allowed God to protect him. Seeing our own vengeance is dangerous because we are stealing from God. Vengeance is Mine, and recompense, in the time when their foot shall slide; for the day of their disaster is at hand and their doom comes speedily. Today’s Proverb seems like, “Duh, well YES!” However, if you “flip” it does it mean that all ‘troublemakers” or mischief makers plan evil? Hmmm. 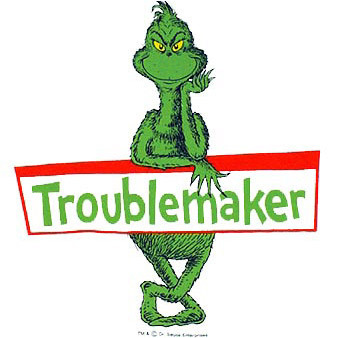 A person who plans evil will get a reputation as a troublemaker.